There are a few vital items everyone should carry when out in the wild. The intent to put together a few important things into a small pocket sized kit is something most outdoor folk are familiar with - I am sure most of us have had a tobacco tin with survival items in it. 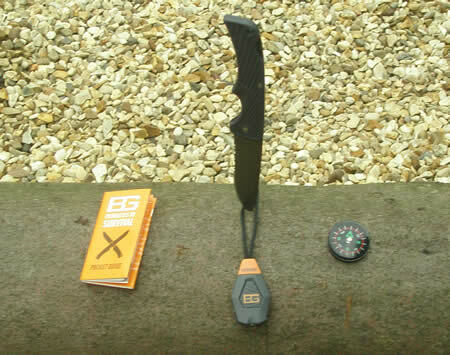 A new contender has arrived on the scene with the Bear Grylls Scout Essential kit from Gerber. With a nod to Bear's role as Chief Scout, Gerber have produced the Scout Essentials Kit. Small enough to fit in a shirt or trouser pocket, light (154g) so not an encumbrance to carry and the packaging is robust enough to withstand my full weight (13st or there about, I'm not confessing my weight here) when I stand on it. 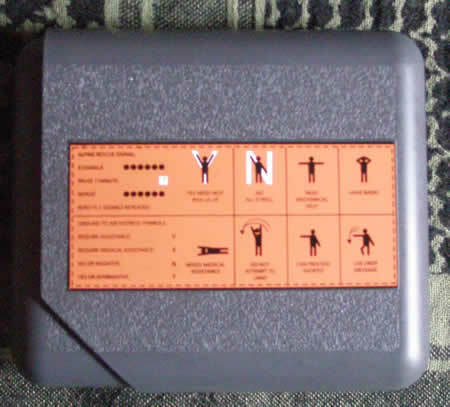 The packaging is made from high density plastic, grey in colour with the Bear Grylls logo in high visibility orange on one side and a stripe of orange on the other, with ground to air signals and alpine rescue prompts on the other. The contents fit within this by the clever method of having a slightly smaller sleeve which slots neatly into the outer layer (note this can stick sometimes If the contents aren't packed just so). First up in the Scout Essential Pack is a Bear Grylls micro torch with lanyard fitting. The micro torch boasts a light of 8 lumens a battery time of 3.5 hours, a beam which casts 15m forward and three light settings: low, bright and flashing/strobe. So it can be used as a main light source, camp or meeting point marker and also as an emergency signal. The Scout essential pack contains a compact scout knife, which is a locking blade knife. This is a lightweight small blade with serrations. It is suitable for most light cutting and carving duties. This knife is better than some that come in pre-made survival kits (in fact I prefer it to the multi tool that comes in the Bear Grylls Ultimate survival kit). As long as you don't attempt something ill-advised with the compact knife it will last well. So that's lighting, cutting and signalling covered, now for fire. This is covered by a pack of waterproof/windproof matches similar to those that come in ration packs. Whilst the chemical reaction can result in little flame, if the fire is prepared properly then these matches are more than sufficient to a warming morale raising fire going quickly. (Assuming the scouts can build a proper fire, my troop used to struggle despite repeated lessons from me, unless they had toilet paper to use). Next comes navigation covered by a button compass. This is enough to establish directions and orientate an individual as to their general whereabouts and which rough direction to travel. Now for the first aid supplies. Consisting of medical tape, adhesive bandages (a bit of an over statement in my opinion I would call them plasters) alcohol prep pads, wound wipes, surgical sponges (non adherent pads to you and me) emergency stitches and moles skin. These items are enough to deal with most minor injuries and complaints folks are likely to expect when out and about. There is an area not covered by this well thought out essentials pack - water. Although the kit container could be used as a water receptacle it doesn't have much capacity. A simple folded bag or even a balloon could have been included within the kit's contents. Nor does this kit have any water purification capabilities. However, as this is described as a scout's essential pack it may be that Gerber and Bear Grylls were concerned there might be the possibility of instructions to be misread/ misunderstood and puri tabs being misused. (I once knew a scout who when informed his camera was disposable threw it away when the film was used up without removing the film - does show how people can misunderstand things). There is space to fit some Puritabs and a small folded bag into the scout essentials kit but it would have been nice to have had them included. The scout essentials kit comes with Bear's Priorities of Survival which is a handy aide memoire. All in all the Scout Essentials Pack is a good combination of first aid kit and personal survival kit. It can be a little awkward to fit all the contents in after getting something out, but as one pack filling two needs this is genuinely an essentials pack. You can buy the Bear Grylls Scout Essentials Kit directly from this site.